Back when I was a seminary student and living in West Virginia, an Episcopal Priest friend of mine told me a story. Fresh out of Seminary himself, Fr. Dale considered himself quite the Liturgical, Theological and Musical snob. Being in a Baptist dominated community, he would regularly get requests to sing the hymn, “In the Garden.” This is one that my congregation sings almost every Sunday at the nursing home. Fr. Dale would go on a rant about how this is a hymn that one ought not to sing. Why would Christians, whose biblical faith values community far above individualism, who have heard Jesus’ explicit command to deny self and live for others; why would they ever sing, “He walks with me, talks with me, tells me I am his own”? Some years later, a Baptist clergy friend of his helped knock him off his high horse when he heard his rant about that hymn and quoted some familiar words: “The Lord is my shepherd; I shall not want. He makes me lie down in green pastures, he leads me beside still waters,” and so on. Touché! Of course, we have a personal relationship with God, but still, Fr. Dale thought the word “private” is rarely a helpful word in communities of faith. As an aside, that reasoning is why “In the Garden” still has never appeared in an Episcopal hymnal. And this, my wise friend told me, is how we know God has a sense of humor! In no construction of reality that you could conjure would he ever have considered, especially not publicly as a solo, singing that song in a worship service over which he presided! But he got trumped. Trumped by love and the power of last words. And at the man’s funeral, his face red with embarrassment and feeling the effects of his humble pie, Fr. Dale sang, “and He walks with me and he talks with me.” The whole thing. With feeling. The imminence of death is indeed sacred ground, and in those moments, we cling to last words in hopes of gleaning some meaning, some promise, some legacy. Every transition, every transformation, is a death of sorts, as well as a new birth. For something new to be fully born, something old must die. It’s the way of the world. Even the transitions we welcome are always bittersweet. Having cared for many children in the past, I think of the series of last words with which we bombarded them…before first getting on the school bus, before driving the car alone, before that first date, before going off to college. Chapters 13-17 of John’s gospel are Jesus’ earthly life last words to his disciples as he prepares them for a major transition. Something new, the ministry of the disciples and the church, is about to be born; and as with all births, something, namely Jesus himself, must die. In that holy ground context, Jesus says, “As the Father has loved me, so I love you, and so you should love one another.” What is it that matters when all else, including life itself, is said and done? What is the most compelling, the most powerful, the most enduring force in all the universe? What, as we prepare both for living and dying, becomes the echoing refrain? LOVE! Not the normal “What do I get out of it?” kind of love we usually mean when we use the word. Jesus was specifically commending to his followers agape love, the unconditional and self-sacrificing love that he himself exemplifies. How does one measure such love? “Greater love has no one than this, than to lay down one’s life for one’s friends,” for the beloved. Last words matter. They are precious. Of all that Jesus might have said, he chooses love and relationship, even as he chooses us in love and sends us into the world to be love. This love is not a feeling or inclination, but obedience to his commandment to choose to love others as God has chosen to love us. Sullivan Ballew was killed seven days after he wrote that letter, at the 1st battle of Bull Run. 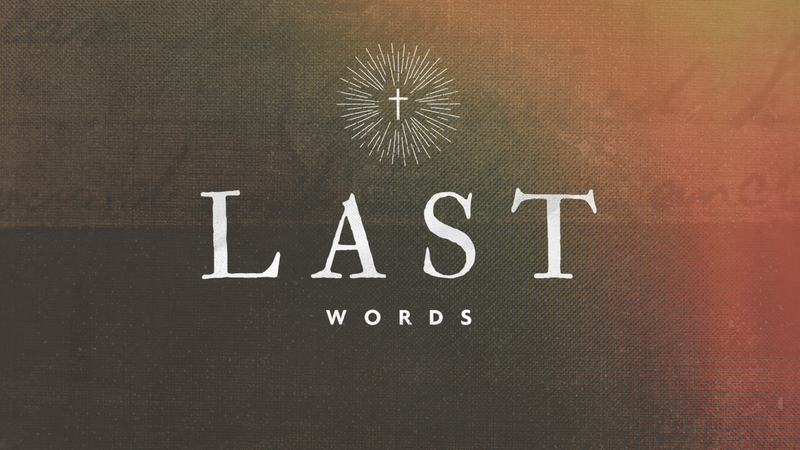 “When my last breath escapes, it will whisper your name, Sarah.” And the next day after Jesus shared his parting words, he was crucified, his last breath on the cross and first breath in the resurrection whispering your name…your forgiveness. “As the Father has loved me, so I have loved you.” It is your name he whispers before you’re formed in your mother’s womb, in the waters of baptism, around the altar, in the Word, and in the fellowship of Christ’s people. It is your name, no matter how far you may wander, that if you pause to listen you will always hear. “Listen to me, Child. I love you. And now your only job is to share that love.” The first, and the last, word is love. Amen. Reblogged this on The Oratory of Sts. Sebastian & Peregrine.